Half of the country has an investment relationship, but over 90% has a banking one. Case Foundation is organizing to bring Mighty to SXSW 2018 alongside Calvert Foundation and Swell Investing to talk about tech platforms that are engaging Milennials to manage their money for impact. Themes discussed at SXSW tend to be discussed all year, and tech bringing transparency into the flows of community capital for the advancement of communities should be one of them. Please vote for transparency of choice of impact for everyone to make it to the SXSW stage. Please vote for transparency of choice of impact for everyone to make it to the SXSW stage. Mighty is excited to have been named 1 of 125 social enterprises (1 of 48 in the US) accepted into the 2017 startup cohort awarded scholarships to SOCAP 17 in recognition of commitment to building businesses that will create a positive impact for communities. Mighty team will participate in a pre-SOCAP workshop for impact startup awardees on October 10, prior to attending SOCAP October 11-13 in San Francisco. To see a list of all impact startups awarded, click here. On June 13th, Impact Engine hosted a panel discussion and networking event Is the Bank Account the Onramp to Bringing Impact Investing Mainstream? by partnering with Coalition Impact in Chicago and Mighty Deposits, a technology platform that connects impact-oriented customers with impact-focused banks. The focus of the discussion panel was what banking for impact looks like now and its future opportunities. Banking for impact is the power that people have to choose socially-responsible banks, such as those that power small businesses and local farms. By investing their money, banks can leave a positive social impact. A platform like Mighty is one solution to this dilemma. A marketplace for people to shop banks at the intersection of money and meaning, Mighty helps people find banks that support the same causes they do. "If you want your money to impact black neighborhoods, investing in black-owned banks in black neighborhoods is a big way you can impact that,” Abello suggests. Mighty identifies these community-oriented banks and informs about their footprint. That way, people have better access to the power they’ve always had to invest in banks that share their values. Panelists spoke of a depth to banking that hasn’t been explored much to date—the impact of individual deposits. A little known fact, banking for impact can involve just the simple act of depositing money in socially-conscious banks. “When we’re talking about the power of banks and what they can do, deposits are the low-hanging fruit,” pointed out panelist Ronald Milsap, manager of Mission-Based Deposits at Urban Partnership Bank, one of two certified black-governed banks in the city of Chicago. The discussion touched upon the current state of banking across the country. The panelists affirmed the potential of banks to create positive social impact in the future. "The conversation is moving to: here are the ways banks can do good and be good businesses at the same time," Mark Newberg, Director of Impact Strategies for Wombie Carlyle, said. Is the Bank Account the Onramp to Bringing Impact Investing Mainstream? 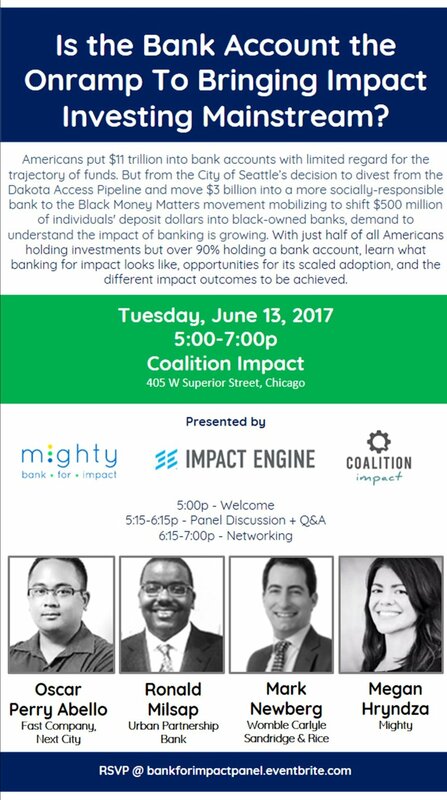 Join Us Tuesday, 6/13 at Coalition Impact in Chicago, panel begins 5:15p, networking runs 6:30-7p. RSVP via Eventbrite, here. Oscar Perry Abello is a New York City-based Fast Company + Next City featured journalist covering urban and community development across the United States, with a focus on the impact and role of finance in driving social and economic justice. Oscar is an alumnus of Villanova University, where he received a B.A. in Economics, with a minor in Peace and Justice Studies. Ronald Milsap is Manager of Mission-Based Deposits at Urban Partnership Bank, one of two certified black-goverened banks in the City of Chicago. He previously worked with U.S. Bank. Ronald received his B.A. in Business from Morehouse College and serves on boards for My Block My Hood My City, Urban Initiatives and Christ the King Jesuit College Preparatory School. Mark Newberg is Director of Impact Strategies for Womble Carlyle, where he supports the growth of business in the Impact Economy. His previous roles include Deputy Director of Global Innovation Summit, Senior Policy Advisor at the US SBA, and Advisor to the New Orleans City Council post Hurricane Katrina. Mark holds a JD from Tulane and writes on the impact economy for Forbes, HuffPost and The National Law Review. Megan Hryndza is Founder + CEO of Mighty, a startup to shop banks at the intersection of money and meaning for customers prioritizing bank services focused on community and environmental investments. She previously worked with Starcom, Kraft, City First Bank of DC, the Global Alliance for Banking on Values, Women's World Banking. Megan completed her B.S. in Science at University of Illinois Urbana Champaign and certificate in Big Data Management from MIT.